Palm oil policy: we strive to avoid the use of any product which contains palm oil. FEEL GOOD about helping to save the planet and keep Sussex beautiful . . . In our own small way, we are helping to make Sussex more eco-friendly. We can all reduce our impact on the environment by making choices. As a visitor you have an important role to play in assisting us to conserve our natural assets and become a more sustainable destination. Use local products to give you a flavour of the area and help support local communities. Try to avoid overly packaged goods and say no to plastic carrier bags. You can also support us in our efforts to recycle – please ask staff for more details. There are thousands of businesses in the British Isles working to reduce their carbon footprint. Please support their efforts to be more sustainable. We are proud to support WRAS (East Sussex Wildlife Rescue and Ambulance Service), a local charity which provides a front-line rescue service for wildlife casualties, including deer, foxes, badgers, hedgehogs, bats, birds and any other needy creature. We donate £1 for every room booking received to this worthy cause and offer discounts to WRAS supporters. Please visit www.wildlifeambulance.org for more details of this much needed service. We hope that our eco-friendly and fair trade policies will enhance the pleasure of your visit to our friendly establishment. We are committed to sustainability and welcome all comments and suggestions. All rooms have private facilities. 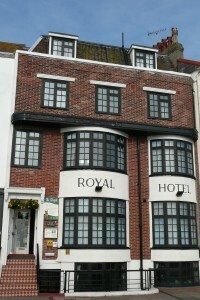 Thank you for making us rank 1 in the category Best hotels for Gay friendly Eastbourne! Recommend us on trivago! 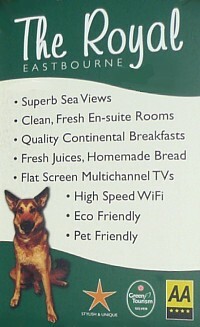 Thank you for making us rank 1 in the category Best hotels for Travellers with pets South East England! Recommend us on trivago! Thank you for making us rank 1 in the category Best Beach Front Hotel East Sussex! Recommend us on trivago!